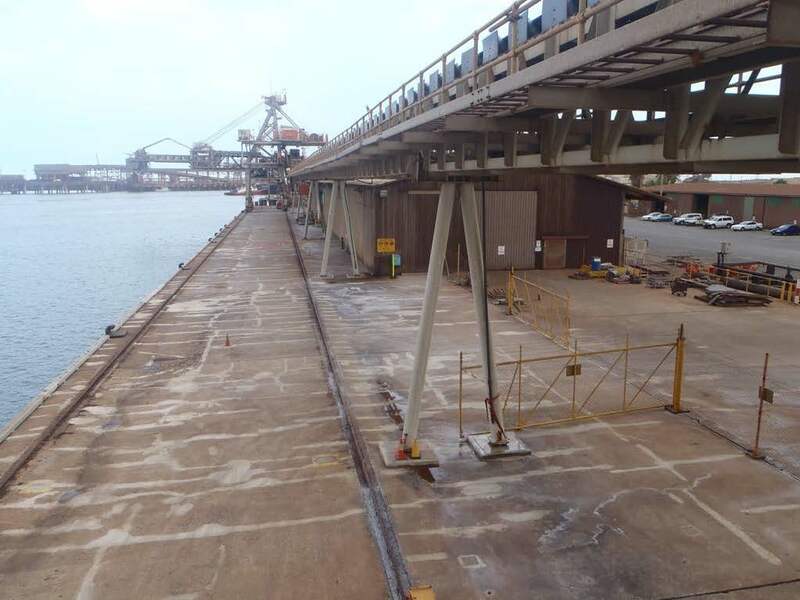 RKF Engineering Services was engaged by our client, a ports corporation, with regard to its salt expert berth in the Northern part of Western Australia. The berth is a salt export facility and subject to adverse environmental conditions that had accelerated the deck’s deterioration by corroding the reinforcement. The extent of damage was so severe that replacing the entire deck was determined to be a more cost effective solution than conducting remedial repairs. RKF Engineering Services was briefed to investigate the condition of the concrete deck and supporting steel structure to develop a scope of replacement. Once the scope was developed, we were to design the replacement deck including concrete, cathodic protection and prepare the tender documentation. The existing steelwork was deemed acceptable to remain although the steel directly supporting the shiploader rails was to be removed and replaced with a deep concrete beam section. The design included precast shiploader rail beams for the length of the berth and cast in situ concrete slabs between and behind them to complete the deck. All of the new concrete will be protected against further damage by corrosion of the reinforcement by integrating cathodic protection throughout the new works. The design of this system, including arrangements and schematics was provided by RKF Engineering Services as part of the design. Construction sequencing was also developed allow construction in occur in between ship movements to minimise shutdown times and disruption to the port operations. Construction of the new berth is expected to commence in the near future and once completed, the design will provide a new concrete deck and shipoader rail support with a minimum service life of 50 years. For further information on this project or in general, phone +61 2 4225 7519 or send us an email.